Our Economy Arc Flash Kit includes everything you need for proper protection in arc flash environments. The 12 Cal Hooded Jacket is made from 1 ply, 9 oz. Indura Ultra Soft material which is fire resistant fabric with certified ratings to assure the user maximum protection. Over pants provide great lower body protection. All arc flash products are designed for worker comfort and reliability. Arc Flash Kit meets NFPA 70E, ASTM F1506 Specifications and is ASTM 2178 Certified. 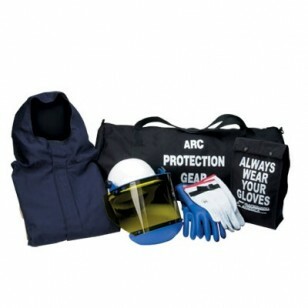 Please note that this arc flash protection clothing product is made to order. This results in slower delivery times, as your product is made to your specifications. Please contact us for details if you have any questions or concerns. Please note: The jacket size you select will also be the size of the over pants. If you need a different size please note it on your order. Note: NFPA 70E requires workers to be outfitted in Flame Resistant Protective Clothing that meets the requirements of ASTM F1506 when there is a possible exposure to Electrical Arc Flash. The short duration and intense energy presents a unique safety hazard. Employers must assess the potential hazard and determine the flash protection boundary distance. Stanco’s Protective Clothing has been designed to meet standards for a particular Hazard-Risk Categories with a minimum ATPV Rating of the assigned value. It has been confirmed by OSHA that garments which meet the requirements of ASTM F1506 are in compliance with OSHA 29 CFR 1910.269.